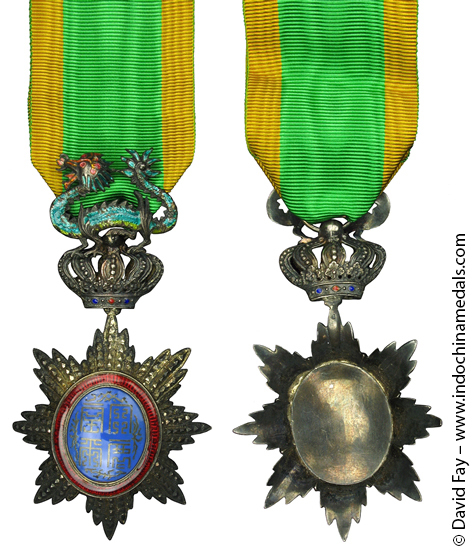 This order, also known as the Ordre du Dragon Vert, was awarded extensively over the years, and between the various French and Vietnamese manufacturers. For instance, on some the dragon is plumper and smaller and on others bigger faced and elongated. Other unofficial varieties include one in gilt without enamel, and one manufactured by Le Maitre without the dragon suspension. There is a version purportedly issued during Bảo Đại’s period of abdication 1946-48 – perhaps a fantasy piece – which has the central medallion in black with one silver Chinese-style seal script character. The authenticity of the above Bảo Đại version also cannot be vouched for. The Dragon of Annam was made in various qualities of metal, including pure gold by A. Chobillon in 1933 for 1055 Francs. One numismatic catalog mistakenly described the seal script characters on the central medallion, which form a patter of squiggly rectangular lines, as the map of the Imperial Palace ! Colonel Rullier has noted that the order was assumed on May 10, 1896, as a national order of France that could be awarded by the President on the recommendation of the Minister of Colonies. It also could continue to be awarded by the Emperor of Annam at his discretion. 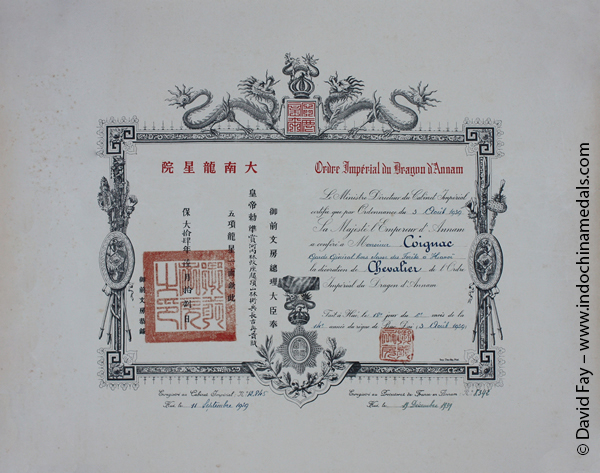 In order to avoid confusion as to whom had awarded this order it was decided in a decree of December 5, 190 to come into effect on May 1, 1900, that the ribbon henceforth when awarded by the President would be green with orange yellow edges, and when awarded by the Emperor would be white with orange yellow edges. These ribbons had hitherto been used respectively for the civil and military classes of the Annamese awards. (The military ribbon had not been recognized by the authorities in France.) Since the white ribbon resembled that of the Royal Order of Cambodia, the Court of Hué decided to change the ribbon to one of red with yellow edges. The emperor alone had the right, according to the regulations, to wear the Knight’s badge along with the Grand Cross (following thus the European monarchial precedent).